771. July 22. 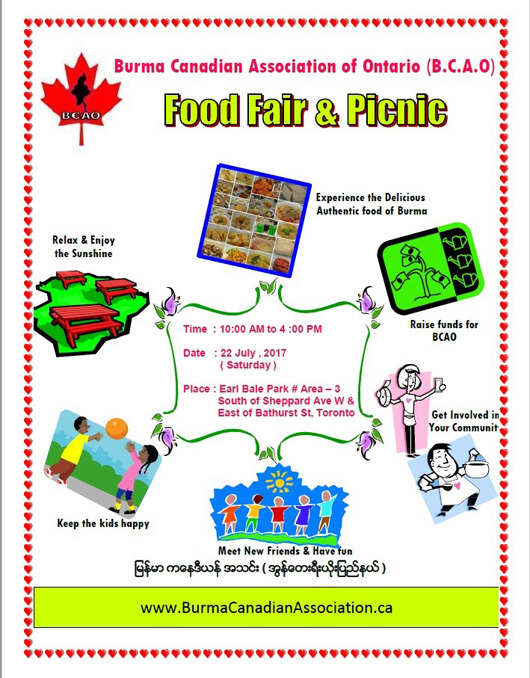 Burmese Food Fair and Picnic – 2017. July 22. 10am-4pm.Free. Earl Bales Park Area 3. South of Sheppard Avenue West and East of Bathurst Street. www.BurmaCanadianAssociation.ca. This Burmese/Myanmar event is one of my favourites because it is small and a real summer picnic. Nothing commercial, or at least there’s been nothing commercial at the picnics I’ve been to in previous years.. You sit down beside some friendly-looking people and the next thing you know, you are sharing experiences of Myanmar or Toronto. The food is probably home-made and recipes are given freely. The kids play games unique to Myanmar. Your kids can easily learn the rules. I’m sorry I can’t make it this year.